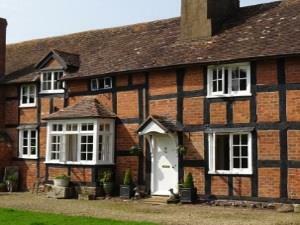 Moor Court Farm01531 670408work01531 670408fax FarmhouseMoor Court Farm is a traditional 15th century timber framed Farmhouse offering fabulous guest accommodation in rural Herefordshire. With easy access to local towns and attractions, Moor Court Farm has spacious en-suite centrally heated bedrooms including a fourposter room. Guest’s have their own lounge and dining room where home produced evening meals are a speciality. At Moor Court Farm there are spacious gardens and you can look forward to a refreshing cup of tea on arrival with homemade cakes and biscuits – or perhaps an evening meal if you arrive late. •Fabulous catering using fine local ingredients and a variety of local wines. •Three very spacious, beautifully appointed en-suite bedrooms. •Beautiful gardens in which to enjoy afternoon tea or a drink in the evening. •Spacious en-suite bedrooms including a four poster room all of which are beautifully furnished. Moor Court Farm is a traditional Herefordshire mixed arable, hop and livestock farm, whose present family have been fortunate enough to have farmed for over 4 generations. The farm is set in its own 500 acres whose rural location will ensure a peaceful stay. From Hereford, take A4103 for approx 9 miles. Turn right signposted Stretton Grandison/Upper Eggleton. The farmhouse is approx. 1/2 mile on the right.